There are "opportunity" costs. According to the U.S. General Accounting Office, the interest rate paid on a plan loan is often less than the rate the plan funds would have otherwise earned. Smaller contributions. Because you now have a loan payment, you may be tempted to reduce the amount you are contributing to the plan and thus reduce your long-term retirement account balance. Loan defaults can be harmful to your financial health. If you quit working or change employers, the loan must be paid back. If you can't repay the loan, it is considered defaulted, and you will be taxed on the outstanding balance, including an early withdrawal penalty if you are not at least age 59 ½. There may be fees involved. Interest on the loan is not tax deductible, even if you borrow to purchase your primary home. You have no flexibility in changing the payment terms of your loan. You are planning to leave your job within the next couple of years. There is a chance you will lose your job due to a company restructuring. You can obtain the funds from other sources. You can't continue to make regular contributions to your plan. You can't pay off the loan right away if you are laid off or change jobs. You need the loan to meet everyday living expenses. You want the money to purchase some luxury item or pay for a vacation. What are some of the most common reasons people take out a plan loan? If I want to borrow for a down payment on the purchase of my primary residence, do I have to pay the loan back in five years like a normal 401k loan? No, most plans allow longer pay back terms when the loan is going to be used to purchase a primary residence. Ten to fifteen years is common. How long do I have to pay off my loan if I quit my job? Typically, if you quit working or change employers, it is not uncommon for plans to require full repayment of a loan. Prior to the passage of the Tax Cuts and Jobs Act of 2017, participants who had left employment with an outstanding loan were expected to pay off the balance within 60 days of separation or face a 10% withdrawal penalty and have the distribution be considered taxable income. The Tax Cuts and Jobs Act of 2017 provides a greater repayment window, as individuals now have until the filing deadline of their individual tax return to avoid the tax consequences of a deemed distribution of an outstanding plan loan. Loans from your 401k are not reported to the credit-reporting agencies, but if you are applying for a mortgage, lenders will ask you if you have such loans and they will count the loan as debt. If I default on my loan, will the default be reported to the credit-reporting agencies? If you default on a 401k loan, the default will not be reported to the credit-reporting agencies and it will not negatively impact your credit rating. If I can't afford to keep making the payments on my loan, can I stop them? Once the loan has been made, your payments will be deducted from your pay each month and you generally can't stop this process. If I default on my loan, how will I know the amount I must report as income on my federal tax return? You will receive a 1099 from the plan which will show you the exact amount to report. This amount will also be reported to the IRS. I still have a 401k account at a former employer. Can I get a loan from this old 401k? Plans are not require to let former employee take plan loans and few allow them to do so. Where can I learn more about how my specific plan handles 401k loans? Talk to your plan administrator or ask them for a copy of your plans Summary Plan Description (also known as an SPD). The SPD will spell out exactly how and why you can obtain a loan from your 401k. 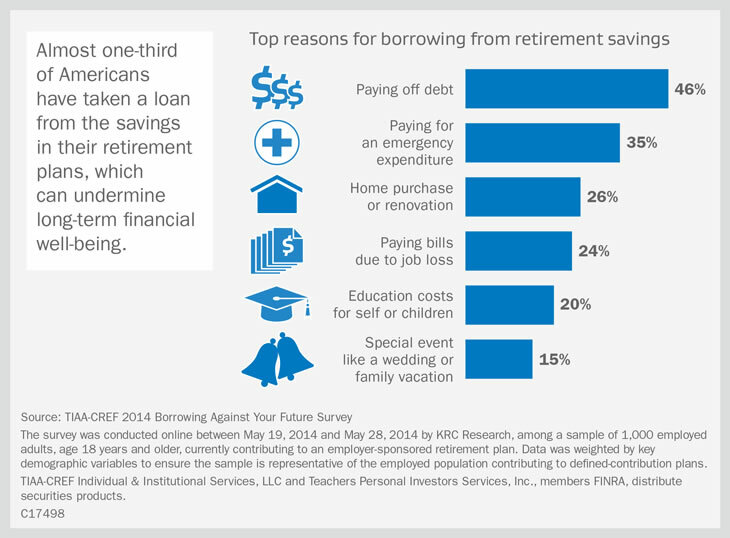 The Pitfalls of Taking a Loan From Your Retirement Plan - Abstract: "I might need my money." This is a remark that is frequently voiced by retirement plan participants. Plan loans are one way to ensure access, but, as the author notes, there are several pitfalls related to these 401k plan loans that participants should be aware of. Plan Loans -- Whose Money Is It Anyway, and Why Should You Care? - Abstract: Plan loans are popular with both employers and employees, but loans bring with them a number of additional administrative and legal requirements for which the plan sponsor is generally responsible. Improper plan loans are among the most common defined contribution plan compliance errors. This 20-page paper from the Journal of Pension Planning & Compliance the complexity of properly administering plan loans. Considering a 401k Loan? Weigh Your Options Before Borrowing - Abstract: Nearly one million 401k investors initiated a loan from their account during the past year. To help pay back these loans, many investors reduce or stop saving in their 401k altogether. But there can be long-term consequences for investors who stop saving, including the potential loss of up to hundreds of dollars in monthly retirement income. Here is a good review on the issue. How to Avoid Borrowing From Your Retirement Plan - Abstract: Have you ever borrowed from your retirement plan? When you need cash in a hurry, it can be tempting. However, there are a couple of reasons why this may not be the best idea.